How Nature Inspires? Why Seek Nature for Success? What is nature? To some, it is the plants, landscape, and animals. It is the physical appearance of Earth and the products in it. How nature inspires human nature? Why is it that when many people want to rest and take a break, they start to seek nature? It could be a walk by the river or a nature walk through the forest. What does nature do to the human brain to make it relax? 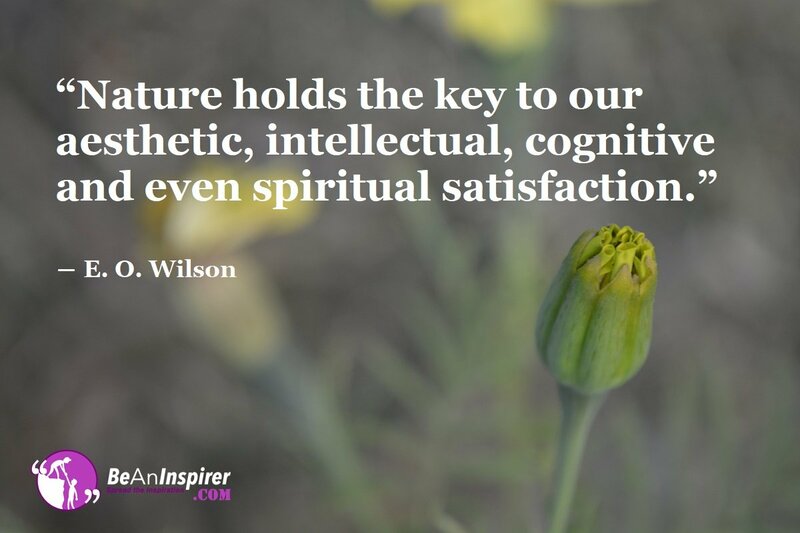 How can you recognize that nature inspires to get the best from nature? When you seek nature, you would always try to stay close to nature. Gradually you will understand how nature inspires; you will start getting positive effects in your life in various ways. Were it not for the sun, what would we do about Vitamin D or other life energies? How would plants produce their own food? Nature has been designed to function interdependently. If there is ever any doubt on the presence of a supreme being, nature is proof. Look at the beauty of the animals that roam the earth, the birds in the sky and the flowing rivers. The perfection of nature gives credibility to spirituality. The power of meditation and mindfulness is often achieved when one is in perfect harmony with nature. Thus nature inspires human life in all aspects. There is no way for us except to seek nature. All the great personalities of the past knew nature inspires. Whether it is Lord Buddha, Jesus Christ, Columbus or Albert Einstein; all of them tried to seek nature to get inspired and to do extremely well in their lives. It does not matter how many times you see the beauty that is nature, it is human nature to notice something different every time. It is normal not to tire of visiting the same spot regularly. Nature does that. It rejuvenates and restores as nature inspires and works for us. It makes people forget their troubles, even if it is for a little while. Nature inspires in the form of the stars, the trees or the water bodies. We seek nature whether we stay home or go out. We try to bring elements of nature to our homes, gardens, and places of work. We seek nature everywhere. We seek nature for fashions, styles, patterns, geometry, medicines etc. Mother Nature can be unforgiving. When she decides to wreak havoc, she does it. It is only when this happens that innovations are made. Hurricanes and other disasters have played a crucial role in the creation of ways to mitigate the damage caused. Despite all this, nature has always caught mankind by surprise. Ancient human beings baffled by the supreme power of nature had started to worship it. They also got some clue from nature to live and exist. They knew that not only nature inspires, it also controls them. This led them to seek nature in every facet of their lives. The technological advancement we see today is greatly influenced by different natural forces and acts. Nature inspires the human mind to tackle natural hardships and also to invent and discover new machines and technologies. Nature is actually no different from us. In fact, we are part of nature. Hence, unless we recognize how nature plays its parts we can’t go far, we can’t excel, or lead a fulfilling life. When we seek nature wholeheartedly, we became nature itself. What are your thoughts when it comes to nature? What do you feel about its impact on your spirituality and emotions? What do you do when you need to relax? Please comment with your opinion on nature and the effect it has on you.